Early Season Dealing Discussion: Trade Pete Alonso? When Pete Alonso hit a very impressive home run to center field in Atlanta on Thursday night, it was his sixth of the season. It also stirred deep reactions in many fantasy owners. Many said things I cannot reprint here because they passed on him in drafts this year. Then, the one guy in every league who did take a late or low dollar shot on Alonso said things I cannot reprint here, but they were letting loose with joy. Of course, as is the nature of the fantasy player who is experiencing early-season success, those latter types quickly stopped celebrating to wonder if Alonso can possibly keep this up. Earlier this week at Citi Field, I posed the same question to two veteran Mets beat writers. 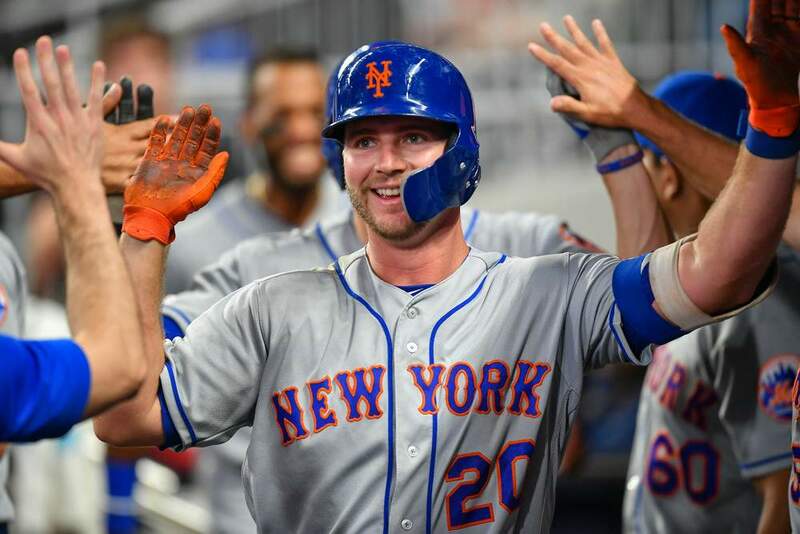 Can Pete Alonso keep this up? They both had the same initial reaction to the question. They responded with none of the assurance a fantasy player wanted to hear. They both said Alonso has not been seen enough by the rest of the league yet to make any kind of prediction either way. They still may expose a lot of his flaws, so cold spells may certainly lie ahead. I continued to play the positive role, saying Alonso has already accepted and met challenges to keep his career on track. Last year at this time, the organization was very uncertain about his defense. So Alonso worked hard on it to the point that he even went to the Arizona Fall League to polish those skills further. This year in spring training, all the whispers about his defense were gone. Then, he played so impressively this spring the Mets actually decided to not manipulate his service time and he made the Opening Day roster. There were widespread expectations that he would begin the year in the minor leagues, but Alonso shattered the narratives. Dominic Smith, another consideration at first base, played well enough that the Mets could have afforded to start him while Alonso went back down. But Alonso played so impressively to the point where New York could not let him go back to the minors. Alonso defied conventional thought processes. I did put those points more succinctly to the beat guys I spoke with, but they remained unconvinced that Alonso is a sure thing yet. These seasoned scribes have seen too many hot streaks from young players who turn ice cold once opponents gain more video and detailed scouting reports on them. Baseball is a constant game of adjustments. Once the league adjusts to Alonso, he will have to adjust back. There is just no full reassurance that he will ultimately hit .280 with 35 homers. So should you sell high on Pete Alonso if you have him? Put in the scope of what you paid for him. In the drafts I competed in, I saw Alonso go for two to four dollars in mixed auctions. In snake drafts, he was picked in the very late teens or early 20s in terms of rounds. If you get an established, proven player that you feel very comfortable with acquiring now may be the time to sell on Alonso. His value may never be higher because we have not seen anything negative in a major way yet. If you are going to get a guy in return who has started slow but is an established fantasy producer, you have to strongly consider it. We’re not even in mid-April yet. Most sample sizes cannot be tied to anything solid. If I can get a truly proven fantasy producer for a guy I paid two to four dollars for, I am going for it. That said, if he maintains a strong pace, I don’t want to be kicking myself later for surrendering his rights for a shaky return. I have to treat Alonso as a guy who must bring me unquestioned quality. I’m not going to settle or just ship him out for a new question mark. There are so many various examples of who you could get offered in return for Alonso, so to throw out one or two examples will do us no good. If you have him, you have leverage right now. Use it wisely. If you have specific offers for Alonso you want me to see and get my input on, tweet me @scotteTheKing. Personally, I believe Pete Alonso will hit .275 with 33 homers and close to 90 RBI. But I’d sell him for a player with a more established body of work who I like and somewhat trust. I’m not shipping him off in any two for one deals. Those likely help the opposition more when they are stacked in one direction. If I don’t get a return that gives me peace of mind, I’ll just keep Alonso. I am buying on Zach Eflin. He is a disciple of Aaron Nola who has absorbed a lot. He was also 7-2 with a 3.15 ERA in the first half last season with a .233 BA. I am holding onto Domingo Santana unless I land in an Alonso type scenario where the return is a proven and established fantasy producer. He is getting regular playing time and is comfortable with his new team. I’m selling Jason Heyward if anyone really believes that a brief flash of past promise is suddenly going to reawaken him. I am selling on Trevor Williams if I can. The XFIP is still approaching 4.00 and he does not strike out hitters enough. I am buying on Maikel Franco. His current owner likely does not value him a lot still, so it won’t take much to get him. Franco has taken well to hitting lower in the order, unlike many other players who would take it as an insult. I am holding Matthew Boyd, His mechanical adjustments and improvement in his slider are going to lead to more quality outings.